13) Dr. Philip McMichael : Leading scholar in the field of global agricultural and food system and chair of the department of development sociology, College of Agriculture and Life Sciences, Cornell University, USA. 16) Dr. Peter Drahos : Professor in Law and the Director of the Centre for the Governance of Knowledge and Development in the Regulatory Institutions Network (RegNet), College of Asia and the Pacific, at the Australian National University, Canberra. He also holds a chair in Intellectual Property at Queen Mary, University of London. A recent attempt by the Thai government to consider allowing for an open-field testing and commercialisation of genetically modified (GM) seeds raises concerns from the Thai National Farmer Council and over thirteen civil society groups, including the Alternative Agriculture Network, the Confederation of Consumer Organisation, Thailand Organic Trade Association, Green Peace Southeast Asia, BioThai foundation, and many others. 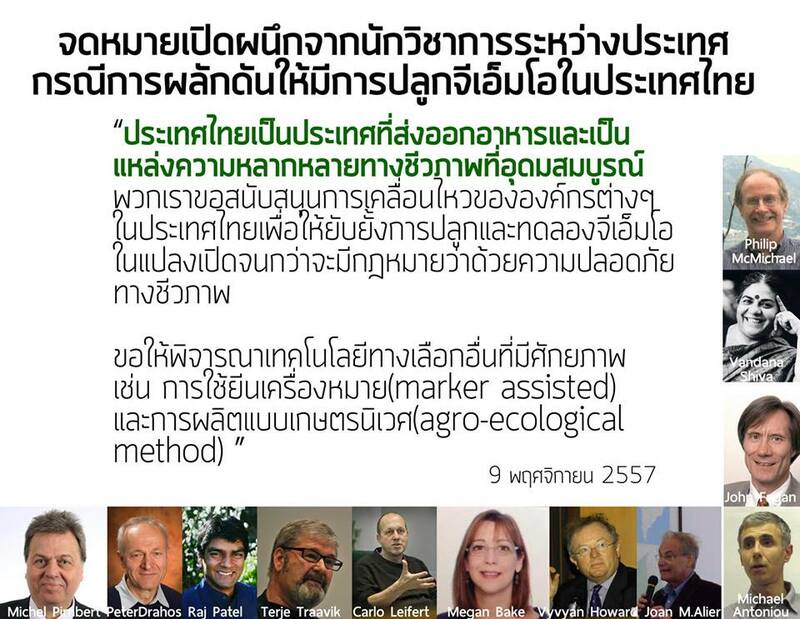 On the 30th of October 2014, this alliance of civil society groups submitted a letter to the Prime Minister of Thailand urging him to: 1) stop the government from permitting open-field testing of GM seeds until Thailand passes a Biosafety law which enforces accountability in the case of genetic contamination; 2) establish a national committee under the Thai National Economic and Social Development Board (NESDB) to develop a national strategy to promote sustainable agriculture and organic farming, involving representatives from stakeholders, especially farmer networks, grass-root and non-profit organisations, as well as related parties in the private sector. On the same day farmer groups and their allies also submitted letters voicing the same concerns and demands to Provincial Governors in eleven other Provinces across the country: Chiang Mai, Mahasarakham, Khon Kaen, Yasothon, Surin, Nakhon Sawan, Supanburi, Chachoengsao, Chantaburi, Songkhla, and Pattalung. As concerned scientists and academics who specialise in the areas of biotechnology, agriculture, food, the environment and development, we support the campaign and urge the Thai government to consider accepting the two demands. Existing academic literature suggests that while it is unproven that genetically modified seeds are higher yielding, there are causes to be extremely concerned by genetically modified crops' negative ecological, social, health, and economic impact. Under the current intellectual property rights system which allows for monopoly control over genetically modified seeds, farmers may be forced to pay inflated-prices for these patent seeds, not to mention that Thailand risks losing export markets as there is a growing global consumer trend which rejects GM crops. The threat of negative environmental impact and risks of contamination also suggest that genetically modified crops will undermine Thailand's potential to further develop sustainable agricultural practices such as organic farming. Since Thailand is a net-exporter of food and an extensive source of biodiversity, possible negative impact from the introduction of GM seeds is a serious concern shared by the global community. We strongly urge the Thai government to withhold its endorsement of GM seeds, and to consider supporting other promising technologies such as marker-assisted plant breeding and agro-ecological production methods. Under the current global context of climate change and food security concerns, research and expansion of ecologically sustainable production should be encouraged by the state. * The names are chronologically ordered and the most updated list of names can be found at www.biothai.org.It should also be noted that the views expressed by these individuals do not necessarily reflect the views of their institutional affiliations.